In order to contribute to the Documentation efforts, you can edit pages directly on GitHub which is the repository of our content. 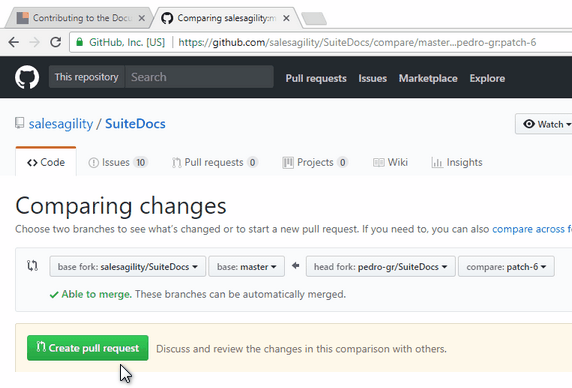 You need a Github user account to edit pages on the SuiteCRM Documentation Site. If you don’t have one yet, you will be given the opportunity to create one during this process. Simply use your browser to go to the page you want to edit. You can use the menus and search feature to facilitate this. 2. Click to "Edit this page"
Every page on the site has an "Edit this Page" link near the top. 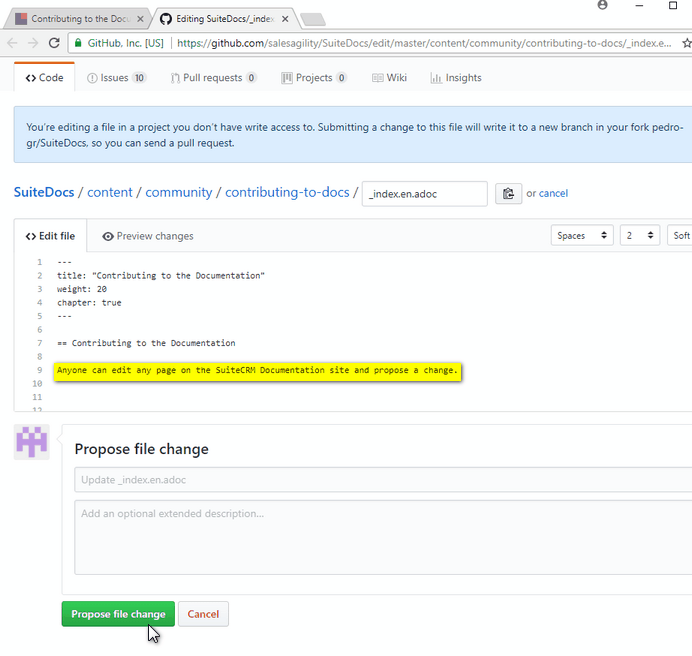 You are taken to GitHub where a text editor will allow you to edit the source code of the file. The format used is called Asciidoc, and looks pretty much like plain text. If you’re just editing text, don’t bother learning the format, just go ahead and edit it! In this example, we inserted the sentence highlighted in yellow, and we click the green button at the bottom that is labeled Propose File Change. You could make additional changes to other files before proposing your change to the site maintainers. But for our first simple edit we’ll do it immediately. In this screen, you can improve the title of your proposal, add descriptive comments, and review your changes. But that is all optional - all you really have to do is press a green button again, this time it’s labeled Create pull request. 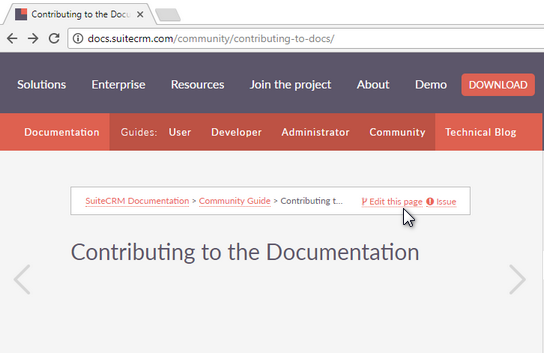 Your proposed change is now up for evaluation by the members of the Community in charge of the SuiteCRM Documentation site. They will receive an e-mail notification as soon as you finish your proposal. You can check the status of every Pull Request, and participate in any discussion about them by visiting this list. Of course, this was just a starter’s guide. If you’re ready to use more Asciidoc features and really leverage all the power of Github, make sure you check out other tutorials.